They are every horse owner’s nightmare and, come June, flies and midges are out in force. The weather starts hotting up and horses are turned out 24/7 to make the most of the glorious sunshine. But being outside means flies. Everywhere. Biting flies, horse flies, feeding midges, you name it; horses are being affected by it. Apart from being obvious nuisances, flies carry diseases and trigger allergic responses through their secretions. Biting flies pierce the skin and transmit toxins, sending the immune system into overdrive. Sweet Itch is a debilitating condition caused by the saliva of the Culicoides midge. In some horses, the protein components present in midge saliva trigger the over-production of histamine, resulting in inflamed and itchy skin that is easily broken. Even more unpleasantly, flies tend to congregate around the horse’s eyes, nose and mouth which causes near enough constant aggravation. These areas are particularly sensitive and next to impossible to scratch. If flies are not kept away, their secretions can cause irritation and inflammation of the skin and are capable of contaminating feed. Bot flies can be particularly nasty as they migrate into the stomach through the mouth and attach to the stomach lining. The horse's gut is one of its most delicate systems so areas can quickly become raw and open to ulceration by stomach acid. Because bot flies interfere with digestion, they can also trigger colic-related illnesses which can be life-threatening. Horse flies (Tabinidae) are a specific type of fly that attack horses and humans when the weather turns humid. They will commonly bite the horse's neck, withers and underside, leaving ulcerated welts on the skin. Unlike other types of flies, the female horse fly tears the skin and draws blood, making infection more likely. She does this in order to get the protein needed to reproduce effectively and lay her eggs. Because horse flies favour damp environments, they are more prevalent in low-lying pastures and near woodland and streams. Horse flies are typically black or yellow-brown in colour with a metallic sheen and are 20-25mm long. Unfortunately, horse flies are very resilient and can only be deterred with a lot of insecticide. Stabling horses during peak times can be beneficial as horse flies don't like dark environments and won't follow your horse inside. Stable flies (Stomoxys calcitrans) thrive in unsanitary yard conditions where moist detritus has been left exposed. Rotting hay, stable bedding, food and droppings are the perfect breeding grounds for pesky stable flies, which lay their eggs in these areas. Stable flies will most likely attack the horse's legs and underside, leaving the skin irritated and tender. They are a lot smaller than horse flies (approx. 6-8mm) but with a wider abdomen that appears spotted. Like horse flies, the stable fly feeds on the blood of mammals and is therefore capable of triggering an allergic response. The best way to avoid stable fly infestations is to maintain a sanitary stable and yard environment. This means changing bedding that has been urinated on, sweeping up horse feed that has fallen onto the ground, refreshing stagnated water and collecting up droppings. Spraying insecticide over manure piles will help to prevent fly larvae developing. Black flies are another seasonal nuisance that come out to feed at dusk and dawn. There are hundreds of different types of black fly and most are small enough (2-5mm) to slip through the mesh of fly rugs and masks, causing a significant problem. 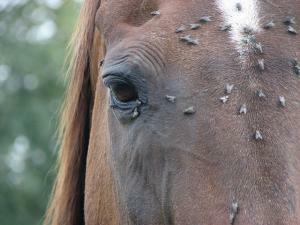 Black flies tend to congregate around the horse's face and ears, causing painful lumps that bleed and scab over. This process attracts more flies, only exacerbating the harmful cycle. Because of their pitch black colouring, these flies are easily seen on most horses and livestock. Stabling horses at dawn and dusk when black flies are most active is a good method of defence. Midges are everywhere during the summer months and are problematic for horses turned out. The most common biting midge is the Culicoides which is implicated in sweet itch - a condition that involves an inflammatory skin reaction to the saliva of the midge. In horses with a hypersensitivity to midge saliva, summer can be an uncomfortable time of year, with affected horses often rubbing themselves raw to relieve the pain and irritation. Unfortunately, sweet itch is a self-perpetuating problem that is difficult to relieve once symptoms have begun. Because midges are a lot smaller than flies (approx. 1mm), they are much harder to spot. The first obvious sign of a midge problem will probably be your horse incessantly itching itself, either on the ground or up against fence posts and trees. A rug will only prevent itching if it's worn at the start of the season before the midges have had a chance to feed. Preventing flies is next to impossible during the summer when horses are put out to graze. Even with effective fly control, there are no guarantees your yard, paddock and stable will be fly and midge free. But fortunately there are some simple measures you can take to minimise the impact of flies and reduce the risk of allergic reactions and infection in your horses. - Fly rugs offer great barrier protection against midges and flies, whatever the season. Depending on the type of flies and the areas they are biting, fly rugs incorporate hoods that extend over the neck, head and ears - areas that are particularly prone to attack. They are also specifically designed to extend beneath the belly, over the rump and down the tail. VioVet sells a great range of breathable rugs for protection against midges and flies, which can be viewed here. - Mechanical control in stables and tack rooms is an excellent way of keeping out flies. This includes screening across stable doors (mesh or sticky paper) and using a downwards facing fan that keeps air circulating. Using sticky paper is also a great means of monitoring the number of flies as you move through summer and into autumn. - Stabling your horse at dawn and dusk will help keep the worst of the flies and midges off your equine. While it can be tempting to leave your horses grazing 24/7 during the warm summer time, stabling them when biting critters are most active will do your horse the world of good. - Fly repellents vary in effectiveness and come in many different forms. VioVet stocks an extensive range of fly repellents in spray, cream, oil, wipe and lotion form, which can be viewed here. Citronella oil is probably the most commonly used repellent in homes, yards and stables but lavender oil, eucalyptus, lemongrass and peppermint can also help curb the persistence of flies. Many home remedies are believed to work wonders and shaking together a simple solution of apple cider vinegar, hazel and eucalyptus oil makes for a gentle and effective natural treatment that can be wiped over horses to prevent flies. Adding a few drops of washing up liquid to a spray bottle filled with warm water is also believed to prevent and kill flies when sprayed directly onto affected surfaces.